The Fixing America's Surface Transportation (FAST) Act was signed into law on December 4, 2015 and continued the Highway Safety Improvement Program (HSIP) with only minor changes. The FAST Act confirmed the overall purpose of this program is to achieve a significant reduction in traffic fatalities and serious injuries on all public roads through the implementation of infrastructure-related highway safety improvements. The Strategic Highway Safety Plans are now required to be updated and evaluated regularly by each State. The $90 million High Risk Rural Roads (HRRR) set-aside has been eliminated but a new HRRR Special Rule will require States to obligate funds on HRRRs if the fatality rate is increasing on rural roads. The Transparency Reports (5 percent) are no longer required. The annual reports from the States will be posted on FHWA's website. FHWA is required to establish measures for the States to use in assessing the number and rate of fatalities and serious injuries. The Safe, Accountable, Flexible, Efficient Transportation Equity Act: A Legacy for Users (SAFETEA-LU), which was signed into law on August 10, 2005, (Public Law 105-99) established the Highway Safety Improvement Program (HSIP) as a core Federal-aid program. SAFETEA-LU established extensive new resources and opportunities to advance highway safety throughout the country in a comprehensive, strategic manner. The specific provisions pertaining to the HSIP, are defined in Section 1401 of SAFETEA-LU, which amended Section 148 of Title 23, United States Code (23 USC 148) to incorporate these provisions. These requirements include the development of Strategic Highway Safety Plans (SHSPs), in consultation with other key State and local highway safety stakeholders, and a number of reporting requirements. Additional information on the HSIP can be found on the HSIP Fact Sheet at http://safety.fhwa.dot.gov/safetealu/fact_sheets/ftsht1401.cfm. SAFETEA-LU authorized $5.06 billion over four years (Fiscal Years 2006 through 2009) for the HSIP. As part of the HSIP, $220 million is set aside each fiscal year for the Railway-Highway Crossings Program (23 USC 130). These funds provide for the elimination of hazards and the installation of protective devices at public railway-highway crossings. Additional information on the Railway-Highway Crossing Program (also referred to as the Highway-Railroad Grade Crossings Program and as the Rail-Highway Crossings Program) can be found at http://safety.fhwa.dot.gov/hsip/xings/. Also as part of the HSIP, a new High Risk Rural Roads Program was established that provides funding for construction and operational improvements on rural major or minor collectors or rural local roads. Additional information on this program can be found at: http://safety.fhwa.dot.gov/hsip/hrrr/. The current requirements for the HSIP are defined in the Code of Federal Regulations, Title 23, Part 924 (23 CFR 924), which can be accessed at http://edocket.access.gpo.gov/2008/pdf/E8-30168.pdf). This regulation, which became effective on January 23, 2009, was updated to incorporate changes to the HSIP as a result of SAFETEA-LU, as well as to reflect changes in the overall program that have evolved since the original publication of 23 CFR Part 924. This regulation is intended to ensure that the HSIP is carried out in an organized, systematic manner where the greatest benefits are achieved. Each State's program must include process for the planning, implementation, and evaluation of the HSIP and SHSP. These processes are to be developed by the States in consultation with the FHWA Division Administrator. The Highway Safety Act of 1966 (Public Law No. 89-564), enacted by Congress on September 9, 1966, was the first major effort at the Federal level to reduce the number and severity of highway-related crashes. The primary purpose of this legislation was to provide for a coordinated national highway safety program through financial assistance to the States to accelerate highway traffic safety programs. The 1966 Act required States to develop and maintain a highway safety program in accordance with uniform standards established by the Secretary of Transportation. Initially, 16 standards were established and responsibility for implementing these standards was divided among the Federal Highway Administration and the National Highway Traffic Safety Administration. These standards have now been replaced by priority program areas. The Highway Safety Act of 1973 (Title II of Public Law No. 93-87) established categorical funding for five specific program areas: highway-rail crossings, high hazard locations, pavement marking demonstration programs, elimination of roadside obstacles, and the Federal-aid safer roads demonstration. The Surface Transportation Assistance Act of 1978 (Public Law No. 95-599) consolidated these programs into the Railway-Highway Crossings Program and the Hazard Elimination Programs. Between Fiscal Years 1992 and 2005, these programs were funded as a setaside (10%) of the Surface Transportation Program. With the passage of SAFETEA-LU in 2005, the Hazard Elimination Program is currently the Highway Safety Improvement Program. The Railway-Highway Crossings Program, which is funded as a setaside from the HSIP, is largely unchanged from the original program. The formalized Highway Safety Improvement Program, which was later codified under 23 CFR 924, was formally defined in a Federal Highway Administration regulation titled, Federal-Aid Highway Program Manual, Volume 8, Chapter 2, Section 3 (FHPM-8-2-3), dated March 5, 1979. 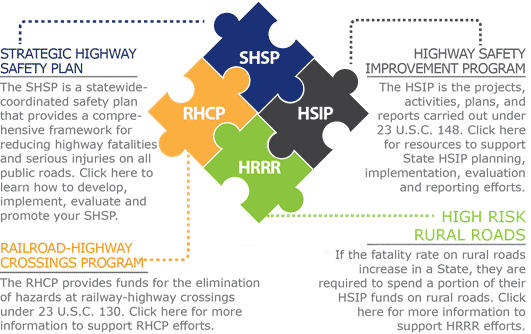 The primary purpose of FHPM 8-2-3 was to establish the policy for the development and implementation of a comprehensive highway safety program in each State and also included components for planning, implementation and evaluation.